"Wellington Rossi Construction Systems was the perfect choice for us. This company is worth five gold stars. Their work performance is exceptional." remodeling and home repair needs. Wellington Rossi Construction Systems is a full-service general contractor with a trained team of workers plus a fleet of fully equipped work vehicles. We specialize in new homes, home additions, all types of remodeling, new kitchens, new bathrooms, masonry, and tile installation. We offer a complete line of services for your new project. At Wellington Rossi Construction Systems we value our working relationship with our customers and we handle your project with the same care and commitment you have for your own home. We take pride in offering our customers excellent quality delivered expeditiously at very competitive prices. Founded in 1999 by Wellington Rossi, Wellington Rossi Construction Systems has excelled in offering expert construction, detailed workmanship, and customer service to home owners in the Boston area including West Roxbury, Brookline, Chestnut Hill, Newton, Wellesley, Weston, Wayland, Jamaica Plain, Needham, Dedham, Westwood, and Norwood. Wellington brings over 20 years of experience in the industry working as a carpenter, mason, electrician and painter in residential and commercial construction. Wellington Rossi's experience, commitment, and keen sense of design will make your dream project a reality. Wellington will guide you through the process and help you with creative design solutions to make your new space not only functional but detailed and beautiful as well. Give us a call today at 617-325-5146 and let's discuss how we can make your dream project a reality. 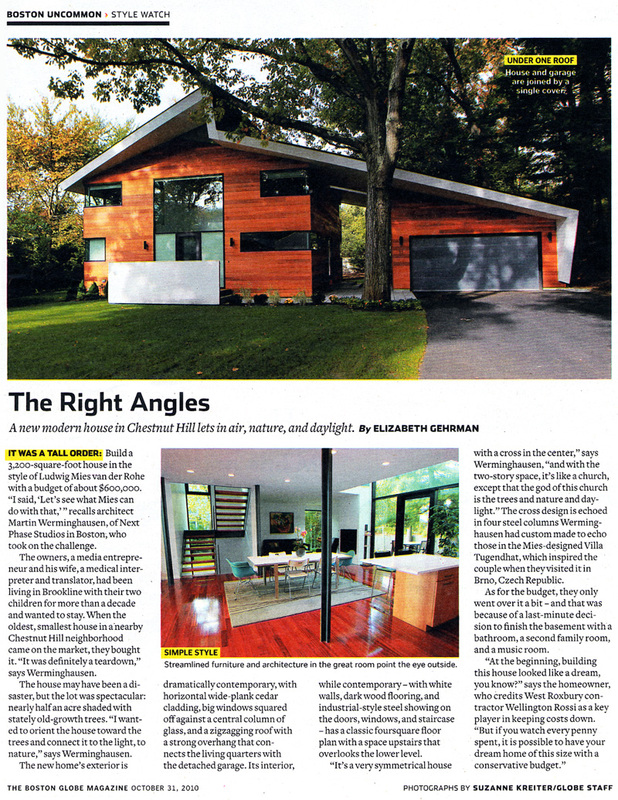 The Right Angles: A new modern house in Chestnut Hill lets in air, nature, and daylight.